2013, The Journey Continues | What an Amazing World! 2013 has been a year of intense travel, both for leisure and business. 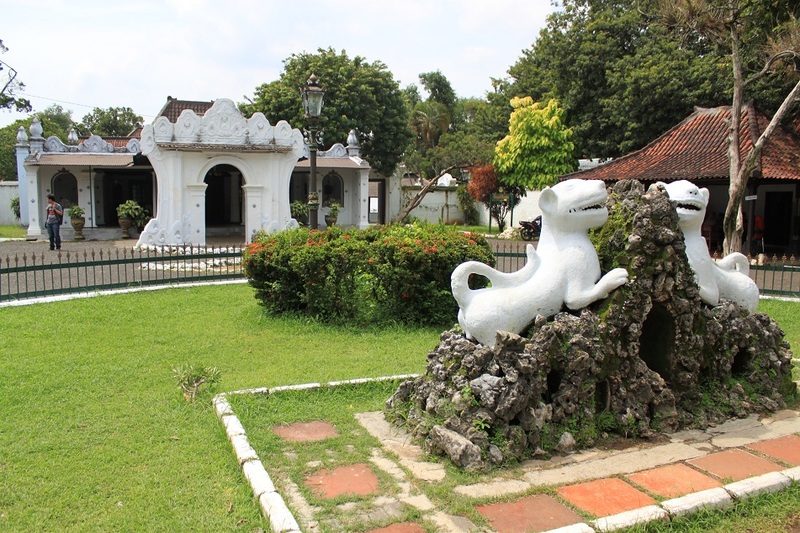 Since January almost every month I left Jakarta to travel, from a short drive to Bogor – a city to the south of Jakarta – to a 14-hour flight to Istanbul. As for What an Amazing World! itself, stories from various places kept the blog not only alive but also thriving to a level I never thought possible when I first started it almost four years ago. As for the number of new countries I visited, 2013 saw the addition of three more countries to the list: Turkey, Taiwan and Timor-Leste. 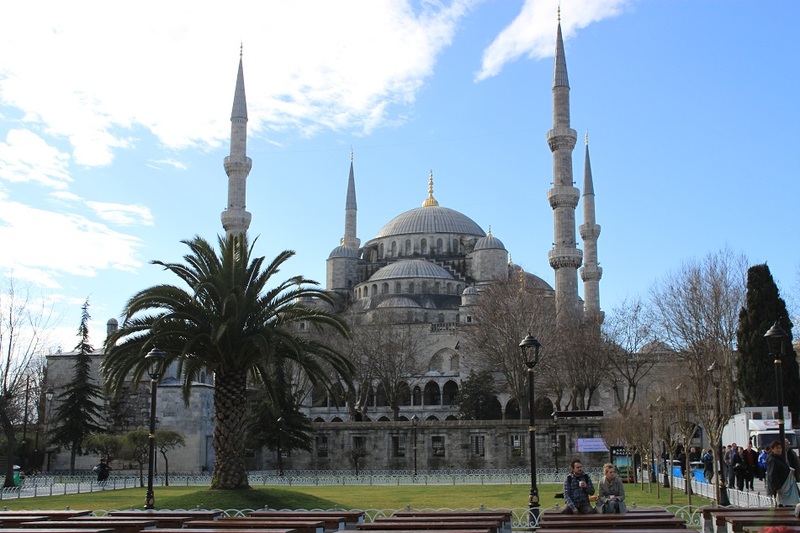 Istanbul proved to be hard not to love, especially for an enthusiast of ancient sites like me. From the millennia-old walls of Hagia Sophia to the classical Ottoman marvel of the Blue Mosque to the lavish halls of Dolmabahçe Palace, Istanbul is a city I would love to revisit one day in the future. Taiwan offered a different experience from Istanbul. The troubled history and current political status of the country made the trip different in a way as it is recognized as a sovereign state only by less than two dozens countries in the world. 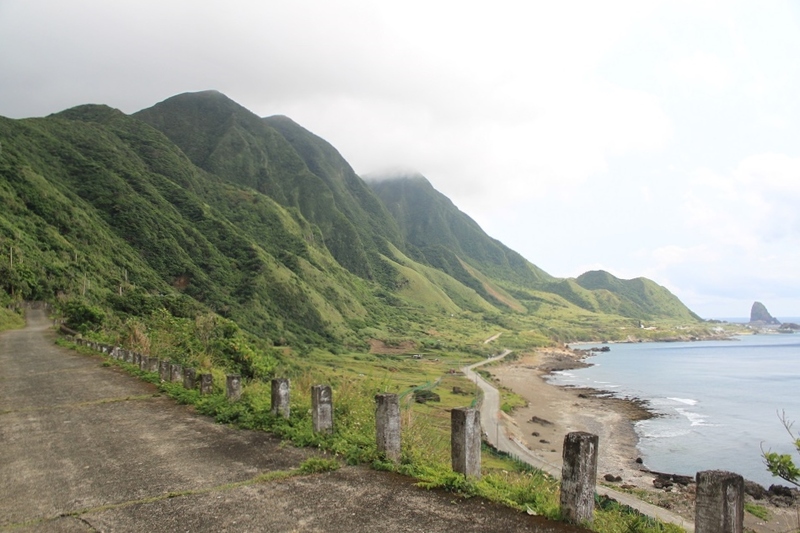 However the highlight of the trip was the 3-night trip to Orchid Island – a small island off the southeast coast of Taiwan – where the aboriginal Tao people live. Culturally oppressed for decades by Taiwanese mainlanders, Tao people are now able to carry on their unique culture and language and pass them to the next generation. Only a few days ago I returned from Timor-Leste (formerly known as East Timor), a former Portuguese colony for about four centuries then annexed by Indonesia for almost 24 years shortly after it declared independence. The new nation has witnessed its early years of nationhood filled with hope and, unfortunately, violence. A trip from its sleepy capital, Dili, to its second city of Baucau and the nearby town of Venilale brought a deeper understanding of daily life for ordinary East Timorese, and what hopeful aspirations the country has in hand. 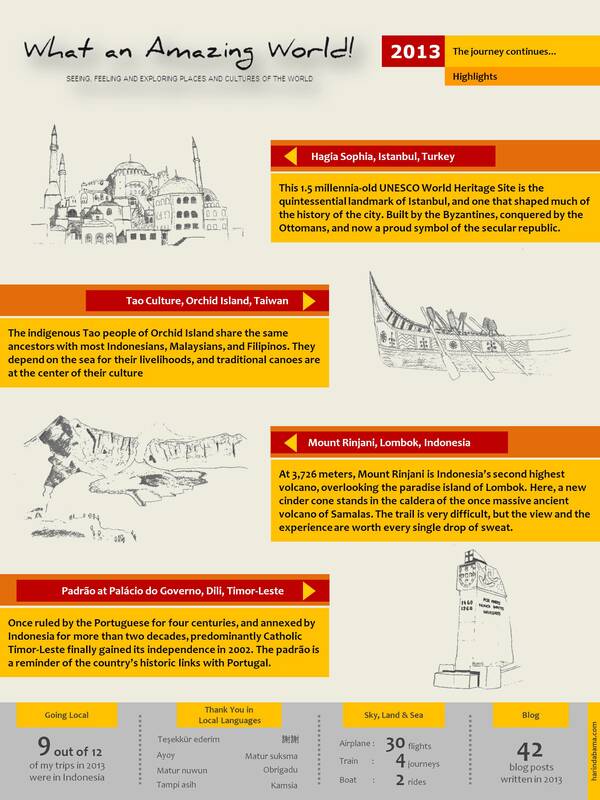 As for domestic trips, in the past 12 months I have not only visited new places around Indonesia, but I have made further explorations in more familiar areas. Some of the greatest trips in the country this year were done in two neighboring islands of the lesser Sunda island chain: Bali and Lombok. From a gruelling but amazing trek up Mount Rinjani – Indonesia’s second highest volcano, to a moment of bliss at Lombok’s incredible unspoilt southern beaches, to the recent unforgettable trip to Bali’s rich cultural and natural landscapes. “If Bali and Lombok were one island, with Bali’s culture and Lombok’s beaches, it would be perfect,” James says. Again, a special thank you goes to James – who has become my perennial travel partner – for suggesting amazing places like Orchid Island and Mount Rinjani. Also to Daily Meaning which was my workplace for the last 1.5 years until my last day in the company a few weeks ago prior to the trip to Bali and Timor-Leste. More adventures will surely come in 2014 even though no plan is fixed yet. Thank you for always following What an Amazing World! and I wish you good health and happier moments in the upcoming year. Happy New Year and see you in January! You too Fiona! Safe travels always! Great recap Bama! Hopefully I can manage to visit Turkey next year. Thanks Firsta! Amen to your wish! 🙂 I only explored Istanbul the last time I went. If you have more time you should also visit other places deep in the Anatolian plateau. I always love reading your adventure through your blog post! Looking forward for your next journey in 2014! Thank you for having been following my adventures, Timothy! 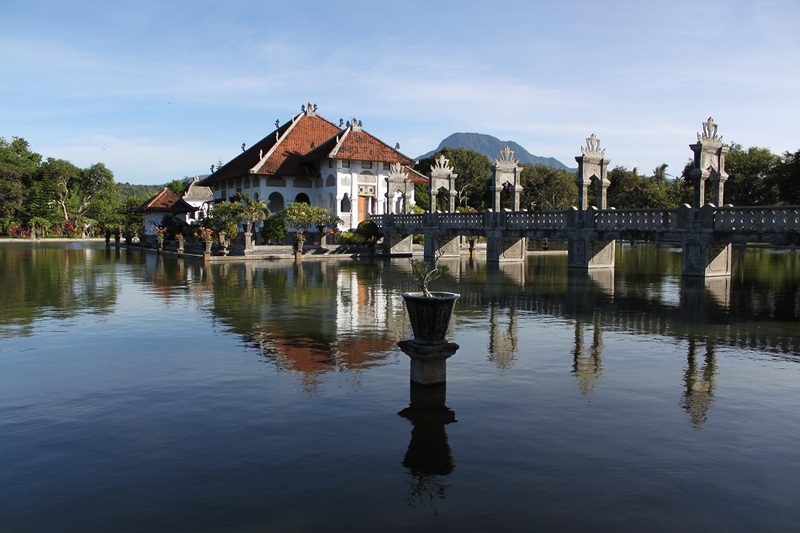 Taman Ujung was one of my new favorite places in Bali. 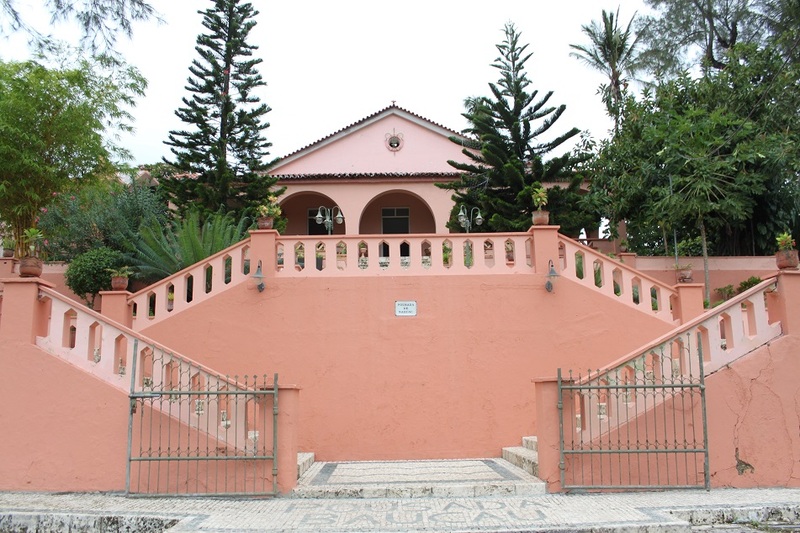 Try to come early in the morning and you might have the entire palace for yourself! Best wishes for you in 2014! Man, I wish I could travel this much! I had the opportunity to travel more when I was younger (parent’s money haha). I look back, though, and it’s so sad that I really didn’t photograph much. The opposite thing happened to me. My dad was not really keen on traveling and he always took me to bookstores every holiday. But I guess that’s one of the main reasons why I travel now: to see what I only saw on book pages. 🙂 But you’ll never know what life brings you. Maybe sooner than later you’ll find yourself exploring the world! I definitely hope so! I’ve been able to do some small travel with the business, and I hope that it leads to larger trips soon! Great post.. wishing you more adventures and inspiring travels in 2014! Cheers! Thanks for your kind wishes, Shikha! Hope you have a wonderful year ahead! Hi Nicole! The same thing goes to you I believe. 🙂 Wishing you a very wonderful 2014 too! 2013 was indeed an amazing year in terms of travel. Wish you a great year ahead, Niko! I always want to visit Mount Rinjani and Turkey..
Yeah i know, i think it’s really hard to climb mount Rinjani, i don’t have experience anyway. The scenery sooooo beautiful.. The beauty is beyond words. The hike was very hard but I don’t regret any single drop of sweat. Selamat Tahun Baru juga! I also feel the same way towards other blogs. I guess we all love to share and read what others share, don’t we? 🙂 Thanks for your kind words! Wish you further and more travelling trips in 2014! i love the graphics! Another incredible entry. Loved reading all those adventures. I do love your blogging style, and your pics are amazing! 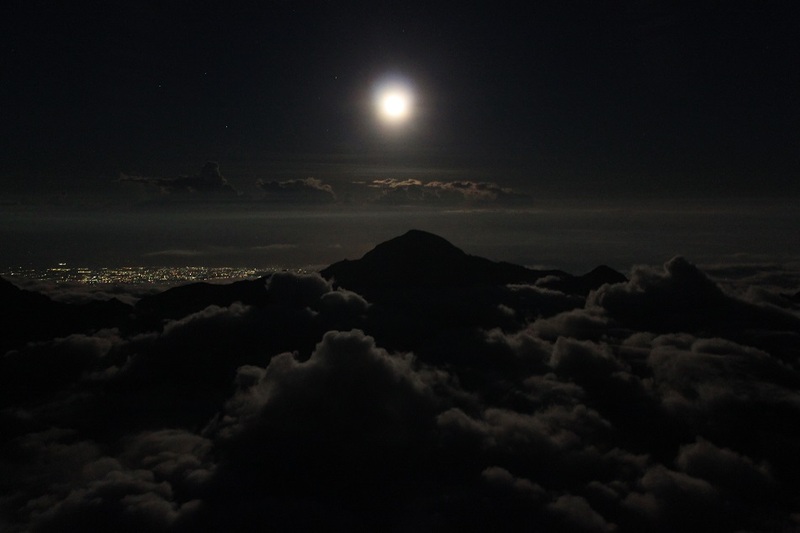 The photo of the moon and Mount Rinjani is amazing!! Thank you so much Terri & James! Such an honor for me to be included in your latest post to wrap up this year. 2013 has been both a wonderful and challenging year for me. But I’m glad it ends well and I’m ready to welcome 2014. Best wishes for both of you in the upcoming year! Hope you travel more and stay healthy throughout the year! Que impresionante vivir tantas historias y espero tener oportunidad al menos de imaginar con su narrativa y esas fotos la singularidad e impactantes aspectos de nuestras ciudades alrededor de un planeta que nos pertenece y a personas como Usted mas que a nadie!! Perdona, no hablo español. But thank you so much for your kind words. Travel blogging is a way for us to inspire each other to explore this planet which hopefully brings more awareness to safeguard what this planet has. Wish you a very amazing 2014! Wonderful to find your blog via James and Terri at Gallivance. I look forward to following your adventures. Isn’t Turkey an amazing spot?! Hi Sue. Thanks for dropping by my blog! Yes Turkey is indeed amazing. I’ve only been to Istanbul but one day I want to come back there to visit more historical sites and natural wonders. Just amazing…. The photos – wow! beautiful, beautiful! good luck in the new year..may it bring lots of new adventures! Thanks Annie and Justin! Wishing you a great new year too and more adventures!